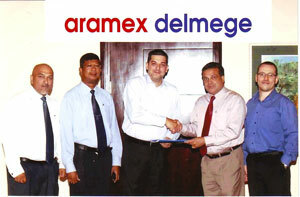 Sri Lanka’s Delmege Group has joined up with Aramex, the global logistics and transportation solutions provider, in forming a joint venture company, Aramex Delmege Logistics (Pvt) Ltd.
At the launch, from left -- Othman Aljeda - CEO Aramex Asia and Shamil Mendis, Director Delmege Forsyth Group shaking hands. Also seen are Bonnie Perera - General Manager Aramex Delmege Logistics, Dilhan De Silva, Delmege Group CEO and Mohammad Yacoub - Director Aramex Delmege Logictics. Aramex Delmege will offer a range of supply chain solutions, including warehousing and distribution, sea, air and ground transportation, freight forwarding consolidation and customs brokerage. A special focus of the new company will be services in process analysis, design and management of supply chain for Sri Lankan clients. The venture further boosts Aramex’s capabilities in the third party logistics (3PL) segment and will expand its global portfolio of clients in various industry verticals, Delmege said in a press release. Aramex Delmege will connect its operations to the integrated communication technology infrastructure at Aramex International, thus enabling a seamless flow of information between Delmege, Aramex and all its global alliance members and customers. Powered by a state-of-the-art tracking system and experienced personnel, the company will offer its clients an array of customized IT solutions.